The Dragoons’ strength lies in their versatility: on horseback they can produce an impressive charge or they can ride to critical spots on a battlefield where firepower is needed. Once dismounted, they can engage in melee or use their muzzle-loading muskets to fire upon the enemy. This flexibility is also their greatest weakness: they are the slowest of all cavalry units and may have difficulty when facing heavier cavalry and elite infantry. Historically, the first dragoons were infantrymen, trained to ride into battle but fight on foot. Equipping cavalry units with horses was an expensive business, and so the best were always kept for the ‘real’ cavalry, leaving the dragoons to make do with cheaper, slower steeds. Dragoons slowly changed into cavalry soldiers like any other, and stopped fighting as mounted infantry, although regiments did retain the dragoon title. 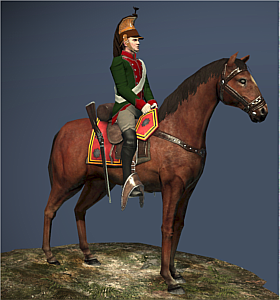 The “old” cavalry had always regarded them as social inferiors, and the infantry had resented them for not being proper soldiers, so the dragoons welcomed their new acceptability as full-blown cavalry.